“This is the life and soul of prayer; but this soul in the present state must have a body, and that body must be such as becomes the soul, and is suited and adapted to it. Some words there must be, of the mind at least, in which, as in the smoke, this incense must ascend; not that God may understand us, for our thoughts afar off are known to Him, but that we may the better understand ourselves. What follows is a beautifully written yet organized approach to prayer that helps lead us through adoration, confession of sins, petitions and requests, thanksgiving and Intercession. This is followed by specific prayers for all occasions. One that particularly spoke to me was one “For the amending of everything that is amiss in the church.” Others include prayers about going on journeys, excessive rain and lack of rain. There is also a thorough treatment of the Lord’s Prayer that expands each phrase with Scriptures. 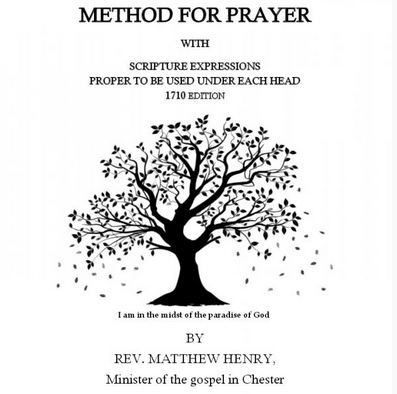 This is one of the great strengths of this work – the inclusion of many strong and powerful scriptures to use on a large field of prayer needs. I highly recommend this as an aid in praying Scriptures.